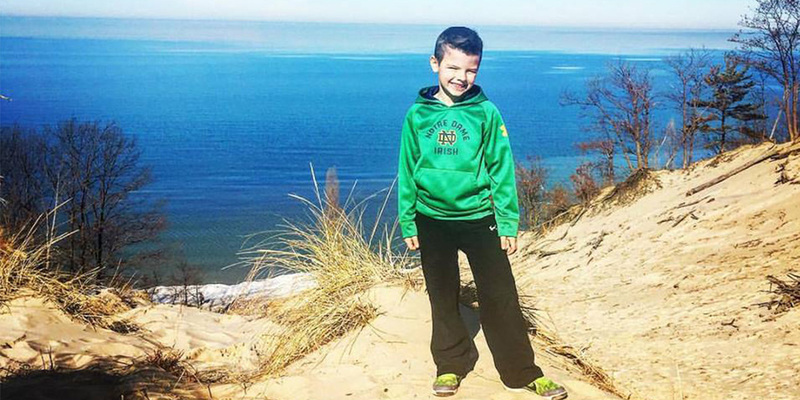 Eight year old Noah Albert is from South Bend, Indiana, a town just 30 minutes inland from Lake Michigan. He and his family frequently travel to beaches up and down the sunset shore of the lake. All of those trips inspired Noah. While every kid loves a day at the beach, Noah decided to make it his personal responsibility to care for them. With the help of his parents, Noah designed and sold Great Lakes t-shirts to raise money for the lakes! 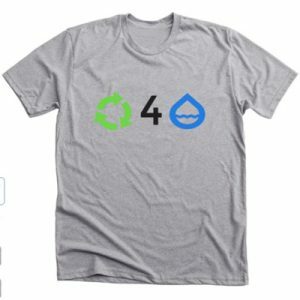 In just a few months, Noah raised $400. And after some research, Noah decided to donate the funds he raised to the Alliance — and we’re thrilled he did. We invited Noah to our Chicago headquarters, and he and his family visited last week. The Alliance presented him with a certificate acknowledging and congratulating all of his hard work. Noah presented the Alliance with something, too! A handmade check for the $400 he raised. Noah said his motivation for raising the funds is to keep beaches clean for everyone who uses them. “I really don’t like it when people litter,” he said. Left: Alliance for the Great Lakes Development Coordinator Carolyn Rudinsky presents Noah Albert with a certificate celebrating his achievement. Right: Noah Albert and his family present the Alliance with a super sized check donation for $400. Noah isn’t stopping at donations in his quest to end beach litter! 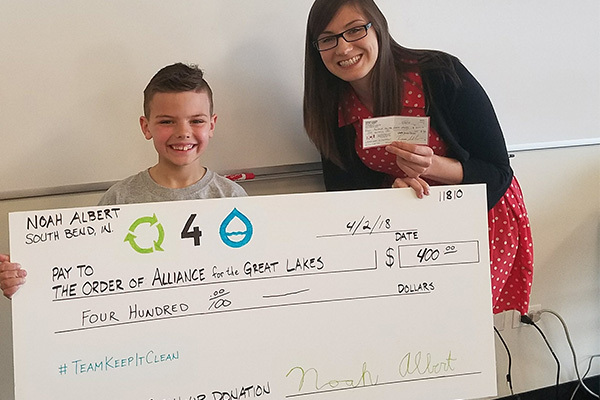 If you live in southeast Michigan you can join Noah and the Adopt-a-Beach team he started, #TeamKeepItClean, for their first ever beach cleanup on Earth Day this year. Thank you, Noah, for all the hard work you do to protect the Great Lakes. We’re excited to see what the future holds for this Great Lakes leader! You can help Noah! Donate now to protect the Great Lakes for generations to come.